Looking to improve your conditioning before track season starts? Well look no further. Track Star USA has developed a detailed and easy step-by-step conditioning training program with a training schedule, videos, and descriptions that clearly explain what to do, how to do it, and when to do it. And the best part, it’s only $5. That’s right! For less than a Friday night pizza you can have an easy-to-follow 4 week training schedule that will surely help prepare you for your upcoming track season. If you let the off-season slip by, then there is no time to wait! In this 4 week conditioning program I’ll show you how to reach your potential this track season with proven conditioning workouts that are designed to improve your performance and get you where you need to be well before the first official day of track season starts. 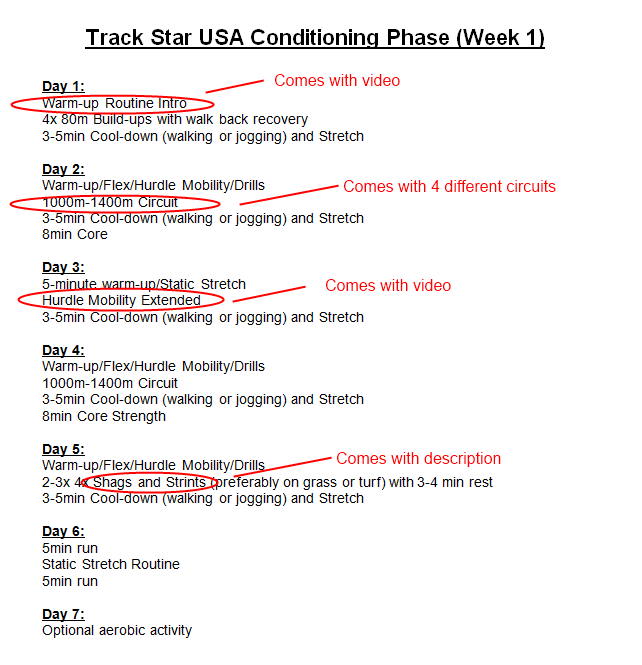 This 4 week conditioning training program is great for all track athletes of all abilities (including elite athletes). This training program is not full of impossible exercises with ridiculous intensities or expensive equipment either. Instead this 4 week conditioning training program was designed with challenging exercises and intensity ranges that allow you to to elevate your conditioning levels efficiently. This 4 week conditioning training program is versatile and can be used for more than a means to get you ready before track season. You can also use this training program during your track season, off season, summer training, and winter training. The goal with this 4 week conditioning training program is to challenge you a little, then a little more, then a little more, and then a little more. With this principle, the idea is to allow for you to improve your performance with each challenge rather than fully submerge you into a state of fatigue, because if you did that, then you would improve very slowly or even worse, not at all. How fast will you receive your 100m/200m training materials? Once you have completed your Paypal transaction, you will be given immediate access to a password and a log in page that will allow for you to log in and review your training materials. It’s that easy. If you do not receive a noreply email containing your log in information within fifteen minutes of your Paypal transaction, check your spam or junk mail folder. If you still do not receive a noreply email, Send us an email.